I can only ever recall one occasion where Chris Powell lost any of his composure. It came during a pre-season friendly at The Valley in 2000 when Charlton played Serie A side Vicenza a few days after the drowning of 17 year old Charlton youth team full-back Pierre Bolangi during a training exercise organised by the Army in Aldershot. The club, on the eve of its return to the Premiership, had been torn apart from top to bottom. Only a few days before he died Bolangi had travelled with the first team to the west country and was a popular, willing ‘gopher’, making his sudden death one that permeated the entire club staff, from the first team squad to the cleaning staff at the training ground. The Vicenza game was played in an atmosphere of intense sorrow and an extraordinary emotional taughtness. I’ve never known an atmosphere like it in 35 years a fan. Chris Powell, one of the most thoroughly decent men in football, took Pierre’s death particularly hard and, during the second half, after what appeared to be a verbal exchange with a Vicenza player, half-pushed, half-throttled the Italian. It was a fleeting raising of the hands, no more than a fraction of a second, and Powell immediately walked off the field to the dressing room before the referee even arrived on the scene. He’s too decent a man to reveal whether the player had said something about Bolangi’s death, but in his entire Charlton career on the field and in the dugout, this quarter of a second was the closest he ever came to losing his cool. In the light of the conditions he’s worked under in the last three years and in particular the provocation he’s faced since Roland Duchatalet’s takeover, it’s an immense tribute to the man’s dignity. It sounds trite, but there really is something special about Chris Powell. As Charlton fans our blood is up at the moment following his outrageous sacking yesterday – outrageous in the fact it happened at all, outrageous in the way it was apparently carried out – and it will be a while before heads cool and we can reflect properly on what happened. But this is certainly different from the previous kicks in the teeth – Robert Lee going for a song, Scott Parker flouncing out after having his head turned by Chelsea, hell, we even lost The Valley for seven years. But through all those you felt that the Charlton spirit would sustain us, the spirit that kept the club afloat in 1984, the spirit of the Back to the Valley campaign, the spirit that carried us to and through the Play-Off Final, the spirit that kept us punching well above our weight through all those years in the Premier League, even the spirit that took us to ninth place last season with what was essentially a League One squad. 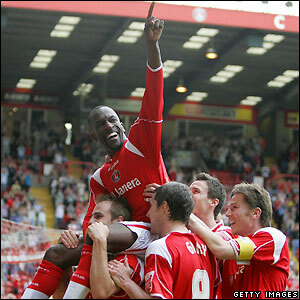 This feels different though, even allowing for the rawness of the morning after, because Chris Powell embodied that Charlton spirit more than most. As a man and manager, as he was as a player, Chris Powell is classy, decent, honourable and dignified. And talented. To take us out of League One with a club record 101 points with a hastily-assembled squad of journeymen and then, with essentially the same squad, end the first season in the Championship with the faint whiff of the play-offs on the breeze is a monumental achievement, even before you consider the morale-sapping goings on behind the scenes that caused some of the most loyal, long-serving club staff to walk. And now this. The pathetic charade of Duchatelet’s press conference the other week. The reports of a new contract Powell signed being returned without countersignature and the message he was fired. The forcing on him of substandard players and the apparent insistence that he play them. The last team he fielded, at Sheffield United in the FA Cup on Sunday, contained not a single one of those players. That was very Chris Powell. No whining to the press, no tantrums, just making his unmistakable point in an unshakably classy manner. What this means for Charlton Athletic may not become immediately clear beyond the fact that the new owner clearly neither understands nor cares about the club he’s bought to add to his strange collection of middling European teams. This would have been an awful way to treat any manager, but especially the one who’s held the club together on the pitch in extreme circumstances following a distinguished career with us as a player. This is different. This isn’t the Charlton I’ve grown up with. Maybe José Riga will lead us on a charge up the table to safety this season and to promotion next. Who knows, one day we may even hear his name being sung from the Covered End. Football moves on. But even if that happens – and it won’t – may we never, ever lose the pang of shock and the boiling sense of injustice over what happened to Chris Powell yesterday. The soul of a club always lies with its fans, but a big part of the soul of Charlton Athletic leaves with him. And it stinks. The whole thing stinks. I’m going to try and temper the anger and disbelief by celebrating the man and his legacy. My favourite memory of Chris Powell, for all the tunnel jumps, all the elegant performances at left back, all his sweeping arm movements when on the ball that looked like he was conducting an orchestra as much as looking for a pass, came at Highfield Road, Coventry, on February 24 2001. Earlier that week he’d been called into Sven-Goran Eriksson’s England squad for a friendly with Spain at Villa Park, something that surprised him and everyone at Charlton as much as it surprised the rest of the country. Charlton players don’t play for England. The Charlton contingent in the away section at Coventry was singing his name even before the warm ups. All eyes were on the players’ tunnel on the other side of the field until eventually a familiar figure emerged from the darkness and into the February sunshine. The roar from the Charlton fans was like a goal had been scored. His name was chanted again in a torrent of delight and goodwill that washed across fifty yards of Coventry mud towards him. He raised his arms, he ran towards the fans, he clapped, and most of all he smiled. That big, bright Chris Powell smile that confirmed he was as beside himself with delight as we were. We were so proud of Chris Powell that day. We still are, immensely so. The overwhelming difference is that on that chilly February afternoon in the west midlands, anything seemed possible. Beautiful and dam right sad at the same time – thanks Charlie. I too was at Highfield Road that February day, it is also one of my favourite CP memories. A mate and I were in the corporate bit in the opposite corner and stood on the balcony amongst loads of suits and sky blue shirts and sung Chris Powell’s name as loud as we could – both as pleased as punch for Chris. Legend. My favourite memory of Sir Chis Powell also came against Coventry. Needless to say, the Valley erupted like nothing I’d witnessed before in the previous 10+ years I’d attended the Valley! A beaming Sir Chris was hoisted on to the shoulders of his team-mates as the fans sounded their appreciation, not just for the goal but his years of dedicated service to the team. A memorable moment for a giant of a man. Like you, Charlie, I will never forget the injustice served out to Sir Chris this week regardless of what the future has in store for the season and the next. It is a sucker-punch served to a man who lives, breathes and eats Charlton. I hope, and I’m sure, it won’t be the last we see of Chris around the club. Wonderful article. We salute you Chrissie Powell! Nice article, Charlie. Difficult times – again. Shame we fell out. Doesn’t sit well with me, but you’ll always have my respect. An excellent article. All Sir Chris needed was the occasional experienced word in his ear, instead of which he got the push. However, he has moved to other places before and come back when the ‘transients’ have moved on – let’s hope he returns once more! very proud that he was a member of our club. Chris Powell’s integrity shines throughout your column. This article speaks to me, it speaks for me. Thank you Charlie C.
Lovely piece, and while I agree with the sentiments, I cannot agree that there was anything classy about the team selection at Bramall Lane that saw us leave the cup in such a supine manner. If CP picked that side without RD signings as some sort of protest, it was not in the best interests of CAFC. Hopefully he just picked the side he thought best suited to the game – and get it wrong. But if he didn’t pick Ajdaravic because he was associated with RD, then he’s done us a disservice – and I hope he wouldn’t do that. Erudite and entertaining as ever Charlie. Thank you. Excellent article, as was Martin Samuel’s in Wednesday’s Daily Mail. What I cannot understand is that there is a section of Charlton fans who see this as a bright new dawn with the prospect of flowing football overseen by a European coach – West Brom and Fulham aren’t doing so well are they!! They feel that the owner, because he has invested in the club can do what he likes – which ,I guess to a point is true. However, in business, if you treat your customers with contempt you will lose them (according to a poll conducted at the Huddersfield game, 80% of Charlton fans are unhappy with the way Chris Powell was treated). Many are not renewing their season tickets – me included – so the club’s revenue will suffer. Whether or not the owner cares, I don’t know, but in my opinion, the there are clouds on the horizon and we could be returning to those dark days at Selhurst Park and attendances barely reaching 7,000. I hope I am wrong but I do not think so, the covered end are not very happy with the demise of a club legend and many may boycott games in the future.